NASAs Curiosity Mars rover took this image with its Mastcam on Feb. 10, 2019 (Sol 2316). The rover is currently exploring a region of Mount Sharp nicknamed Glen Torridon that has lots of clay minerals. NASA's Curiosity rover surveyed its surroundings on Aug. 9, 2018, showing its current location on Mars' Vera Rubin Ridge. The panorama includes skies darkened by a fading global dust storm and a rare view of the rover itself. Two images from the Mast Camera onboard NASA's Curiosity rover depict the change in the color of light illuminating the Martian surface since a dust storm engulfed Gale Crater. At left shows the 'Duluth' drill site on May 21, 2018; at right from June 17. 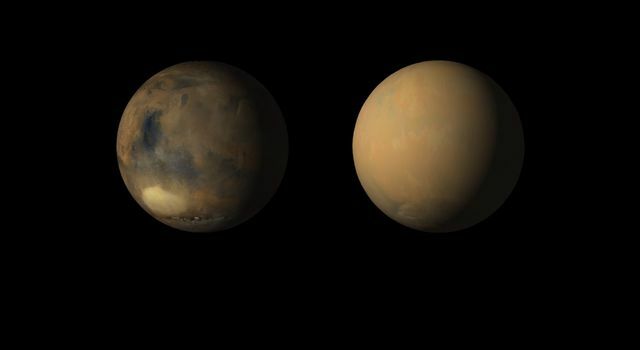 These two views from NASA's Curiosity rover, acquired specifically to measure the amount of dust inside Gale Crater, show that dust has increased over three days from a major Martian dust storm. The drill bit of NASA's Curiosity Mars rover over one of the sample inlets on the rover's deck. The inlets lead to Curiosity's onboard laboratories. A close-up image of a 2-inch-deep hole produced using a new drilling technique for NASA's Curiosity rover. Curiosity drilled this hole in a target called 'Duluth' on May 20, 2018. NASA's Curiosity rover successfully drilled a 2-inch-deep hole in a target called 'Duluth' on May 20, 2018. It was the first rock sample captured by the drill since October 2016. This mosaic taken by NASA's Mars Curiosity rover looks uphill at Mount Sharp. The scene has been white-balanced so the colors of the rock materials resemble how they would appear under daytime lighting conditions on Earth. This mosaic taken by NASA's Mars Curiosity rover looks uphill at Mount Sharp. Highlighted is an area in white with clay-bearing rocks that scientists are eager to explore. NASA's Curiosity Mars rover used a new drill method to produce a hole on Feb. 26, 2018, in a target named Lake Orcadie. The hole marks the first operation of the rover's drill since a motor problem began acting up more than a year ago. Climbing 'Vera Rubin Ridge' provided NASA's Curiosity Mars rover this sweeping vista of the interior and rim of Gale Crater, including much of the rover's route during its first five-and-a-half years on Mars. A vantage point on 'Vera Rubin Ridge' provided NASA's Curiosity Mars rover this detailed look back over the area where it began its mission inside Gale Crater, plus more-distant features of the crater. On a part of 'Vera Rubin Ridge,' NASA's Curiosity Mars rover took this image of a rock surface that had been brushed with the rover's Dust Removal Tool. This false-color image shows how special filters of NASA's Curiosity Mars rover's Mastcam can help reveal certain minerals in target rocks. It is a composite of images taken Sept. 17, 2017. This pair of images from the Mast Camera on NASA's Curiosity rover illustrates how special filters are used to scout terrain ahead for variations in the local bedrock. The Mastcam on NASA's Curiosity Mars rover captured this view of 'Vera Rubin Ridge' about two weeks before the rover started ascending this steep ridge on lower Mount Sharp. Researchers used the Mastcam on NASA's Curiosity Mars rover to gain this detailed view of layers in 'Vera Rubin Ridge' from just below the ridge. 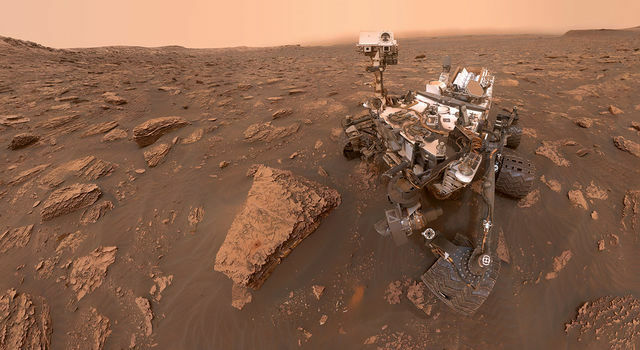 'Vera Rubin Ridge,' a favored destination for NASA's Curiosity Mars rover even before the rover landed in 2012, rises near the rover nearly five years later in this panorama from Curiosity's Mastcam. A rippled linear dune of dark Martian sand, 'Nathan Bridges Dune,' dominates this full-circle panorama from NASA's Curiosity Mars rover. This dark mound, called 'Ireson Hill,' rises about 16 feet (5 meters) above redder layered outcrop material of the Murray formation on lower Mount Sharp, Mars, near a location where NASA's Curiosity rover examined a linear sand dune in February 2017. This panorama from the Mast Camera (Mastcam) of NASA's Curiosity Mars rover shows details of 'Vera Rubin Ridge,' which stretches about 4 miles (6.5 kilometers), end-to-end, on the northwestern flank of lower Mount Sharp. The feature that appears bright blue at the center of this scene is NASA's Curiosity Mars rover on the northwestern flank of Mount Sharp, viewed by NASA's Mars Reconnaissance Orbiter. NASA's Curiosity Mars rover examined a mudstone outcrop area called 'Pahrump Hills' on lower Mount Sharp, in 2014 and 2015. Blue dots indicate where drilled samples of powdered rock were collected for analysis.